We have been in the country of tango since 2014. Located close to Plaza Italia, our office is connected to the dizzy pace of the entire city of Buenos Aires. Palermo and other upmarket neighbourhoods in the city can be contemplated through its picture windows, with boutique stores and restaurants featuring signature cuisine. 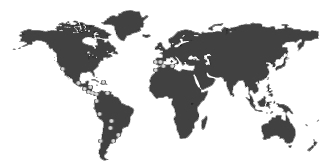 We work with our customers in Paraguay and Uruguay from our Argentina office. Germán Rodriguez is our Country Growth Manager at the Buenos Aires, Santiago and Lima offices. He is Argentine and graduated from the Belgrano University where he studied a degree in Advertising before taking a post-graduate course in Marketing. Germán has been a Director in accounts and operations areas for well-known agencies, such as JWT, FCB, TBWA and di Paola WPP, among others. Lucia Gonzalez graduated from Palermo University in Argentina. She became Facilities and Support, Innovation Leader at Findasense in 2016. Her extensive customer service related track record allows her to successfully perform a range of different roles, and to provide support with supplier payments and staff payrolls, invoice control, and control over office material and its inventory. On the banks of the River Plate, the widest river in the world, Buenos Aires is the most populated city in Argentina with a population of around 3 million inhabitants in the Federal Capital district alone, paling in comparison to over 14 million in the entire Greater Metropolitan Area, known as Gran Buenos Aires. Cosmopolitan like few others and with major European influences, Buenos Aires has a strong foothold as Latin America’s cultural capital. However, this influential city is ranked 40th among cities with the highest cost of living in the world, according to the Mercer ranking: Cost of Living Survey, Worldwide Rankings 2017. As ambassador for the rich and eclectic Argentine culture, Buenos Aires has become an attractive city for tourists from all over the world. The Obelisk, the Bombonera stadium, La Boca neighbourhood and Café Tortoni are iconic attractions for the international tourism community.